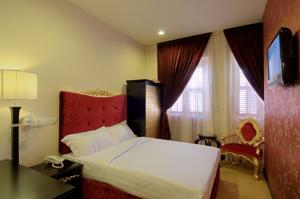 Offering free local calls, Santa Grand Hotel Chinatown is located a 5-minute walk from Chinatown MRT Station. Its modern rooms offer free Wi-Fi, flat-screen cable TVs and safety deposit boxes. Santa Grand Hotel is located along Trengganu Street, a 5-minute drive from nightlife options in Clarke Quay. A train ride from Orchard Road shopping belt is a 10-minute journey away. The modern rooms at Santa Grand Chinatown come with in-room tea/coffee making facilities. En suite bathrooms offer toiletries and hot shower facilities. The hotel offers a business centre that serves the communication needs of guests. Laundry and dry cleaning services are also available. A simple breakfast is served in Santa Grand’s breakfast lounge daily. Rooms: Hotel Rooms: 40, Hotel Chain: Santa Grand Group.